Seventy-two financial services firms in the UK have signed up to a government Charter designed to improve gender diversity in senior positions in the financial services sector. The Charter is based on recommendations made by Virgin Money chief executive, Jayne-Anne Gadhia. Gadhia led a review of women in senior executive positions within the financial services sector. “Growing and recruiting a diversity of talent is important to our sector both for executive and non-executive roles. For many societies gender diversity sits alongside other forms of employee diversity like disability, race, creed and sexual orientation. Download the Women in Finance Charter Signatories list here. 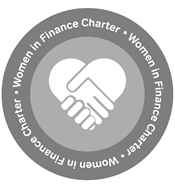 Download the Women in Finance Charter here.